Deep down in the forgotten sewer tunnel, Leo confronts the fish-woman. She attacks, but Leo can’t dodge her speedy movements. The fish-woman lands several strikes with her claws before Leo scares her off with a strong kick. Furious, he attempts to give chase, but the toxic resin he was encased in earlier has made him weak and woozy. 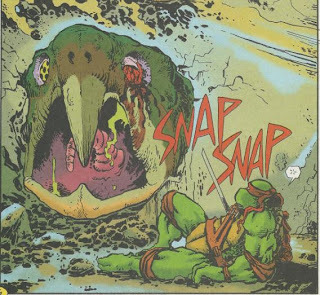 Suddenly, the giant turtle, still alive, crashes its head through the wall and snaps its beak at him. A few levels up in the new sewer lair (under construction), Mike shows Raph and Casey around. For Raph, the concept that he and his brothers will be splitting up is finally sinking in and he feels less excited about it. He’s surprised Leo even let it happen. Mike tells Raph that after their recent ordeal from the past year, Leo has lightened up on the hardened leader shtick and come to accept that “chaos is the natural order”. Raph scoffs at Leo’s so-called nugget of wisdom. As Casey tests out the new basketball hoop, the ground shakes beneath them. Sensing that Leo is below, Mike, Raph and Casey follow the tremors deep into the tunnels. Meanwhile, Leo is running for his life with the giant turtle hot on his heels. 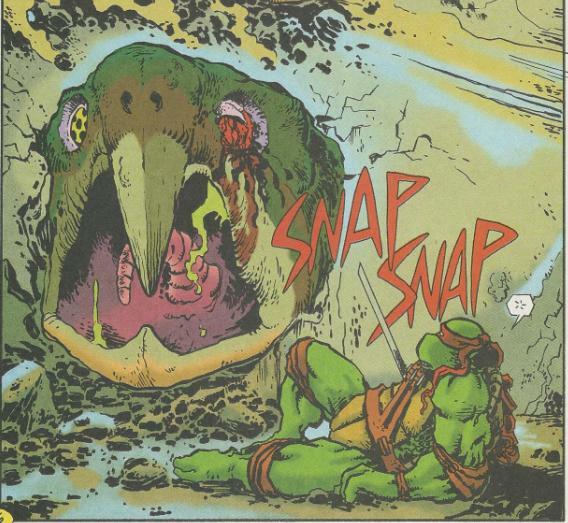 The giant turtle plows into a gas line which explodes, sending Leo tumbling down a drainage pipe. He crashes into a subterranean landfill and amidst the steaming pile of filth, finds a large egg. The fish-woman confronts him, fearing for her offspring. Leo wards her away by raising his katana over the egg. 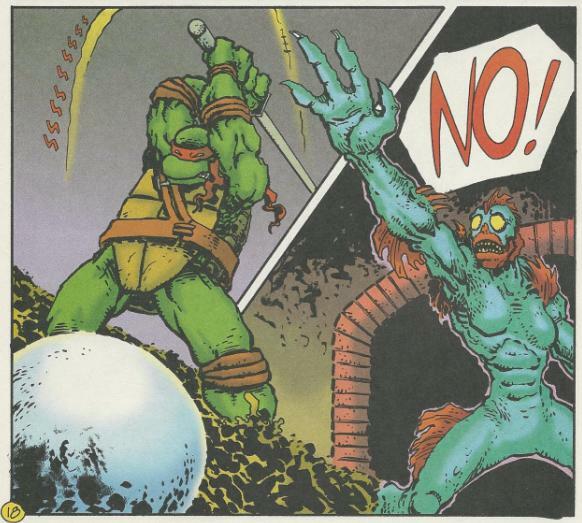 Enraged, Leo is about to destroy the egg when Mike, Raph and Casey show up, yelling for him to stop. Just then, the bloody heap of the giant turtle comes crashing through the ceiling. Leo jumps out of the way just as it lands and finally dies. Mikey and the others help Leo up and carry him home. On the other side of the giant turtle’s corpse, the fish-woman cradles her precious egg, protecting it from fallen debris with her body. In New York harbor, a figure surfaces from the water. It’s Baxter Stockman, having finally arrived at his destination. *This story is continued from TMNT (Vol. 2) #4. The story continues in TMNT (Vol. 2) #6. *The fate of the fish-woman and her egg will be revealed in "The Cure". *This issue also contained a bonus story, “Of Muck and Men, part 2 of 2” by Ryan Brown, Matt Roach, Frank Moreno and Tim Toffoli. The out-of-freakin’-nowhere two-issue story arc featuring the fish-woman and the giant killer turtle concludes. Man, what the hell was THAT all about? It’s a weird diversion that doesn’t amount to a whole heck of a lot regarding the overarching narrative of Volume 2. However, I get the feeling that this random two-parter was meant to be the setup for something bigger down the line which Lawson had plotted out. Keep in mind that Volume 2 was ended early and abruptly, killing a number of Lawson’s planned stories. Honestly, I’m just guessing here, but this story was so completely out of the blue that it HAD to have been meant to have a bigger impact later in the series. But since those plans never panned out, we’re still left with… this. If you can get anything out of this arc, though, I think it’s that we get a brief glimpse of Leo “snapping”, so to speak. Mike says that Leo has become more laid back following “City at War” and that Leo seems to be loosening his grip as the “leader” now that his team is breaking up. But we see here that what Mike sees on the surface is merely Leo putting on a front to stay strong in the eyes of his brothers. Deep down, he’s confused, he’s scared and he’s FURIOUS. I’d like to think that Leo, when in a better mood, wouldn’t have chased the fish-woman after she retreated. Here, though, he angrily gives chase, citing “unfinished business” as his motivation. The fish-woman clearly no longer intended to hurt him, but he just wanted payback. Then there’s the bit with the egg at the end. At first it looks like Leo is just trying to scare the fish-woman away by lifting his katana over the egg, but his rage gets the better of him and he sincerely swings for the kill out of petty spite. Leo knows that these fish-people are endangered (in fact, when last he saw them, he thought they’d gone extinct). He knows this egg may very well be the last in existence. And yet, he gets so angry that he nearly commits infanticide and dooms an entire race to extinction. 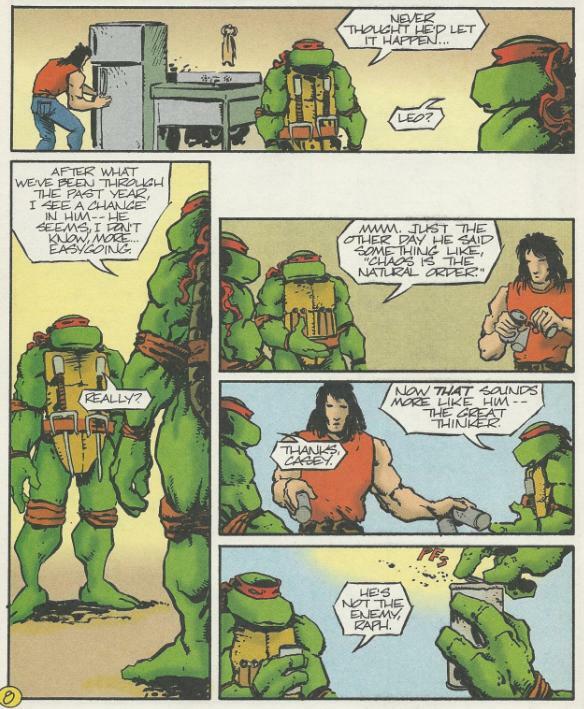 In that instant, you see that Raph was completely right in his appraisal of Leo's attitude. Leo tries to hide how much the dissolution of his family and team is bothering him with fortune cookie rhetoric such as “chaos is the natural order”, but the fact of the matter is he HASN’T truly accepted his fate and he nearly lashes out in the worst possible way. So this fish-woman/giant turtle storyline really is a give and take situation. I don’t like how it undermines “Sons of the Silent Age” and the whole thing just pops right out of the blue, vanishing from the narrative as quick as it came. However, the conclusion shows us what’s lurking beneath Leo’s emotional surface and it’s a real shock. You can divide Volume 2 into four major arcs, with this being the second, and I’ve always found it the least interesting. Still, even in terms of being the “least” interesting, it is not without merit. This is as far as I ever got into Vol. 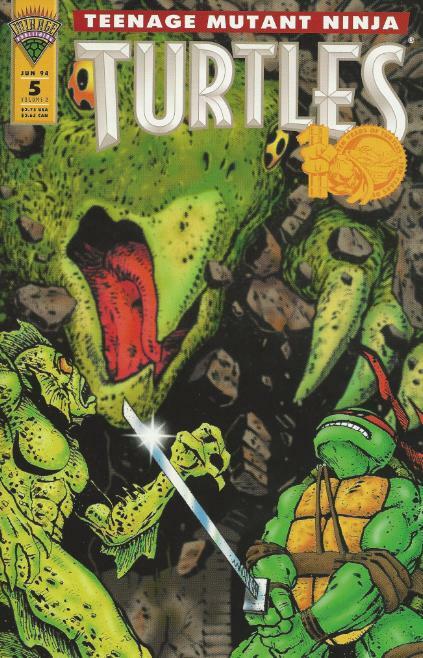 2 because every TMNT scan torrent I find, even the most insanely complete ones, never have the last six issues of this volume, weirdly enough. Even after City at War, it's bizarrely slow-moving after Vol 1. Granted, I've never read any Vol 4.